Today, we’ll be comparing two of the most common coffee brewing methods around, drip coffee and keurig style pod coffee. They are similar but there are points that differentiate these two styles of coffee which are worth exploring a bit. First of all drip coffee is an automatic method of making coffee that has been popular since the 1970’s when auto-drip machines started replacing stovetop percolators in American kitchens nationwide. Drip coffee is super simple to make and for 99% of all machines highly automatic. It’s easy to adjust the strength of the brew to match your preferences… and that’s the main difference between drip and Keurig coffee. With the K-cup you do not have the ability to change much with the brewing process so your coffee can’t be adjusted to taste as easily as drip. Both types of coffee makers have products on the high and low end of the quality (and pricing) scale but the cheapest Keurig machine usually isn’t a lot different than the most expensive one. With drip machines however the cheapest drip coffee machine is usually no where nearly as good at making coffee than the premium models. For instance a basic Mr Coffee drip coffee maker will never make coffee as good as an OXO On Barista Brain but it sure will cost a lot less money! Keurig coffee comes from single serve machines that specialize in making coffee practically instantly. You probably have seen a lot of these coffee machines in business and hotel lobbies. These are simple and quick. You just pop in the flavor k-cup you want and hit the brew button. Assuming the water reservoir isn’t empty you’ll have a cup of coffee in less than a minute most of the time. Those are Keurig Brewers in a nut shell. They are all about speed and simplicity but they don’t allow you to easily fine tune the coffee you make. The size of all k-cups are always the same so you can’t brew a stronger cup by adding more grind and you can’t change the grind size to get the flavor just right either. Are All Keurig Brewers The Same? Are Non-Keurig K-Cup Coffee Makers Different? Some k-cup coffee makers are made by other companies but most will brew Keurig k-cups just the same. There are actually a ton of different non-Keurig brewers out there that are worth looking into too, many of which may serve yoru needs a lot better than actual Keurig branded machines. All k-cup coffee makers (regardless of brand) work basically the same way. They all have a k-cup basket that is sized to hold a k-cup in place. A needle then punctures the top of the k-cup and water passes through the needle into the grounds on the inside. A second needle is situated below the k-cup and it punctures the bottom of the cup so that coffee can run out and into your cup during the brew process. The cheapest k-cup coffee makers works exactly the same way to most expensive machines do! There are however a few good reasons to choose a fancier Keurig-style coffee maker over the lowest priced options. These days the best Keurig out there is probably the K575 or the Keurig K-Elite but those models still probably aren’t as good as the best drip machines on the market. Of course both the the K-Elite and the K575 are still much more affordable than many of the top tier drip machines like the aforementioned Barista Brain or the Technivorm Moccamaster so pricing has to come into play a bit. What About the Coffee? Is the Coffee in a K-Cup Better Than Regular Coffee Grind? K-cups offer many different tastes and options for your coffee and you don’t have to worry about storing grind because each cup is sealed in an airtight environment. Despite the airtight seal however many would argue that Keurig coffee is gimmicky and not actually very good coffee because it’s pre-ground coffee and not nearly as fresh as you can get from a bag of whole bean coffee. My personal opinion is that a bag of plain-Jane grocery store whole bean coffee tastes much fresher when I grind it in the kitchen just before brewing it in an automatic coffee maker than any k-cup has ever tasted from a Keurig machine regardless of the brand. The quality of k-cup coffee really depends on the “K-Cup” you use and your own tastes. For instance a premium brand of organic coffee packaged in k-cups can taste a lot fresher and better than a cheap box of generic brand k-cups. No matter what brand you choose though you can’t use freshly ground whole bean coffee in a Keurig machine unless you pack your own reusable k-cups… and that extra work in my opinion makes the Keurig-style machine unnecessary. You might as well grind your beans and make pour over coffee or drop that grind into a single cup automatic drip coffee maker where you can actually make a great cup of coffee if you want to. Furthermore what’s clear is that k-cups in general are too small to produce a rich cup of coffee unless you brew uncomfortably small sized “cups” of coffee! For the amount of grind inside a k-cup you cant get a full bodied cup of coffee unless you brew only 4 ounce cup sizes! With Keurig machines your coffee is almost always a little weaker than you can get from standard coffee makers or manual devices. Is Keurig Coffee Similar to Instant Coffee? How is it Different? K-cup coffee has also been compared to instant coffee because of how quickly it brews, but it isn’t really instant coffee either. It’s just ground coffee packaged in fast and convenient pods that require no setup to brew. In fact, its hard to look at Keurig and see anything more than a fancy single cup machine that makes somewhat weak drip coffee. It’s no different, just packaged to be a fast, brainless brewing method. Instant coffee is actually a totally different product than any type of ground coffee. It’s heavily processed, typically made from lower quality beans, and is kind of like dehydrated coffee crystals that actually dissolve into your water instead of brew. Check out this article for more on what makes instant coffee different. In the next section of this article lets look into whether Keurig coffee is better or worse than drip coffee, why and how. But first I want to point you towards the best single cup coffee maker I’ve ever used. It’s not designed to do anything other than make single cup drip coffee. It doesn’t use k-cups or any other kind of coffee pod either – I just grind my own beans and brew a single cup at a time. It’s still simple and quick and the coffee ends up tasting way better than any Keurig k-cup I’ve ever tried. If you care about making good coffee and want it one cup at a time you have to give this machine a look. And now, on to the comparison of regular coffee and Keurig coffee. Before I talk about each method individually and why one is better than the other, we need to go over how they are different. Keurig coffee is much quicker to brew than drip coffee, as it is single serve. It can get quite expensive because of the K-Cups. Standard drip coffee has many different forms and many different machines you can use to brew it. Keurig coffee is produced by a single company, but there are still many different ways to brew it. Drip coffee can be produced in larger batches than Keurig coffee. Contrary to what many people believe, Keurig coffee is NOT the same as instant coffee. It is actually quite different from it. Let’s go over Keurig coffee first. Is Keurig Coffee better than Drip Coffee? This can easily be answered by saying it depends but I’ll instead go into slightly more detail. If you want simplicity, ease of operation, and quick cups of coffee without the need for extreme quality then by all means, get a Keurig or some other k-cup brewer and use it regularly. You won’t be disappointed. The speed and ease of use is exactly whey these machines have become popular and it’s their greatest selling point. For the most part the quality of coffee they make is fine compared to the convenience factor. Each k-cup is individually sealed so even though its pre-ground coffee at least it’s not oxidizing for weeks in your kitchen like the big tub of Yuban cluttering the top of your fridge. If however you want to have access to fresher grind and you want to use the correct amount of grind to water to get a full bodied cup of coffee then drip coffee is way better than kcup coffee. 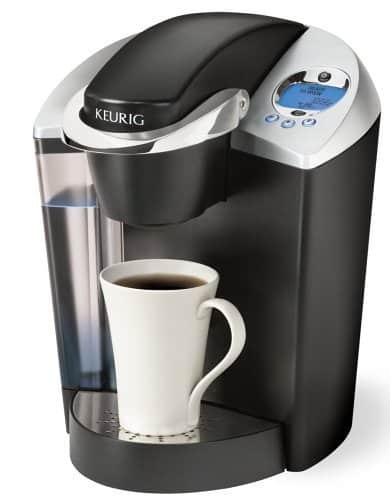 With drip coffee its way easier to brew a strong cup of fresh coffee then it is with a Keurig-style machine. The brew basket is usually large enough to hold plenty of grind and even though regular coffee makers take longer to brew and require you do fiddle with paper filters and coffee scoopers they are still very convenient to use and easy enough for just about anyone to do with little experience. Drip coffee makers are not called automatic coffee makers for no reason. Once you get the coffee in the basket and water in the tank its still just a button push and 6-7 minutes away. Compared to the newest and arguably the best Keurig out today, the K-Elite which can get you your cup of coffee is less than a minute 7 minutes is a long time but since it does it all on it’s own it feels pretty fast on any given busy morning. The only thing faster than Keurig coffee for me is a strong lungo shot from my affordable Nespresso Essenza Mini. That only takes about 30 seconds in my kitchen but I still just make drip coffee most of the time because it usually tastes better than the Keurig and it’s still dead simple to setup. Keurig coffee is also great for someone who lives on their own or for people that just don’t drink more than a single cup of coffee at a time. Keurig coffee tastes much better than instant coffee and yet, it is ready just as fast. Most people think they have to make the trade off in taste to get quick coffee but even though drip might have the potential in tasting better it’s still a much tastier option than grabbing the instant coffee crystals. Click here to see a comparison of Keurig to Nespresso. Now as I said, Keurig coffee is NOT instant coffee. Instant coffee is made from pre-brewed coffee. It melts into the coffee and has a bit of a sour taste because it is essentially dried-out brewed coffee. Keurig coffee, on the other hand, is actual coffee grinds, rather than pre brewed flakes. K-cups take the optimal amount of coffee grinds for a single cup of coffee, and the Keurig machine forces hot water through the cup at a pre-determined pressure and temperature to provide an instant cup of hot coffee. The K-cups have a special filter in them that prevents any sort of grind from getting through, so you don’t have to worry about any chunks or grit left over in the coffee. The thing with Keurig coffee is that most of its sugar and flavor is determined by the type of k-cup you use. Unlike drip coffee, you don’t HAVE to add anything after the coffee has been brewed if you brew flavored k-cups. Most K-cups are made unflavored, just straight coffee grinds, but because of the packaging they can also contain creamers, spices, and sweeteners right in the k-cup to keep things even easier for you. I have a full post on my favorite Chai Latte k-cups right here. Most of those are flavored and sweetened already making the chai latte even simpler to enjoy in the morning. Of course some of the best coffee brands out there also package their coffee in standard k-cups too so Keurig certainly does offer flexibility in offer many different flavors and styles… just not in brewing technique. What this all boils down to: Keurig coffee is one of the most unique brewing methods I’ve ever seen and a Keurig coffee maker is a great office break room coffee maker. If you are considering a Keurig coffee maker, take a look at this one. It’s the Keurig K55, one of their most popular models and these machines have many applications besides just coffee. There are Keurig machines designed for making tea, hot chocolate, and more. The Keurig machines are one of Keurig’s biggest staples on the market. While the Keurig coffee makers are more expensive than most drip coffee makers, they are still rather inexpensive and are well worth the investment. Whether it is for a business or simply for home use, you can’t really go wrong with a Keurig coffee maker. Unless you want to make even better tasting coffee without adding to much more work. In that case read my case for drip machines below. Is a Drip Coffee Maker better than a Keurig Coffee Maker? Without a doubt, I have to say yes, although its not quite as convenient to use. While drip coffee makers are beneficial in their own right and have the ability to make strong coffee in bulk fairly quickly in a hands-off manner they don’t brew as fast as Keurig coffee. They also cant brew the fancy pre-mixed drinks like hot chocolate, chai teas, apple ciders, etc, that you can get from a Keurig coffee maker. I will say that drip coffee makers do have a time and a place to be used. If you have company at home, it will be better to brew in bulk with a drip coffee maker rather than a Keurig coffee maker. If you want to brew the best and freshest coffee and brew it strong then a drip machine beats out the Keurig machine every time! Another major perk of drip coffee makers is that the machines are generally inexpensive compared to Keurigs. Some of the more expensive machines are not usually any more expensive than k-cup brewers they can help you save a lot of time in other ways. Most automatic drip coffee makers have internal clocks you can set to start brewing coffee in the morning, preventing the hassle of having to wait after you wake up. As soon as you get up you can go enjoy a cup of coffee with little to no hassle. They will keep your coffee warm for a set period of time and then they will turn themselves off. That is the big benefit to drip coffee on top of the ability to make strong coffee in bigger batches. Most of their machines have little conveniences like this that make them more and more tempting. They definitely save a lot of time, if you’re in a pinch, but they don’t save nearly as much time as a Keurig coffee machine on a cup-by-cup basis. Really, if you can spare the extra cash, I would own both… and I do own both. I recommend owning a top of the line drip machine to make good coffee in and also a cheap off-brand k-cup machine to make fast cups of liquid caffeine in a moments notice. K-cups won’t ever give you the best flavor so why spend a lot on one if the cheaper models make k-cup coffee just as good. If you are looking into getting a good drip machine, I would recommend a coffee maker like this BESTEK one, it is inexpensive and has the programmable timer, as I mentioned earlier. I would also advise you look at this page for my reviews of the best cheap k-cup coffee makers for sale today. So Drip Coffee or Keurig Coffee? If you can’t quite afford a Keurig coffee maker, drip coffee will always suit you just fine. But I also firmly believe that if you have the opportunity to pick up an affordable Keurig coffee maker to compliment your drip machine then it will be worth it. All methods of coffee brewing are healthy to a certain extent, I think drip coffee has a bit of a one-up there, as it doesn’t have the excess flavoring and such in it and there’s less plastic involved. Here are a few of the commonly asked questions I see from people comparing Keurig and regular drip coffee. Is Keurig Cheaper Than Regular Coffee? It can be if you buy the generic k-cups and compare pricing to the premium whole bean coffee from local reputable roasteries in your area. Typically though most people save a lot of money making drip coffee over Keurig. A standard 12oz bag of pre-ground coffee can easily be purchased for $6 at your local grocery store and that will be enough to make roughly 70 cups of coffee. Run the math and that’s about 8-9 cents per cup of coffee. Even the cheapest of the cheap k-cups I’ve ever seen for sale cost around 30 cents per cup of coffee so you can usually make a lot more drip coffee for your money than you can making them one k-cup at a time. Why is Keurig coffee so Weak? I have an entire post on why your Keurig coffee is weak. Check it out! Can You Use Ground Coffee in a Keurig? Actual Keurig machines are designed for k-cups. They do not include ground coffee baskets. If you decide to buy a non-Keurig k-cup coffee maker then most do include removable k-cup baskets and optional ground coffee baskets to use in their place. Also, all k-cup coffee makers regardless of brand are capable of brewing through reusable k-cups that you have to manually fill with your own pre-ground coffee. This is usually a laborious chore that I do not personally recommend. Keurig coffee machines usually allow you to brew a few different cup sizes. They typically range from 6-ounces to 12-ounces depending on the machine you are using. A common machine may offer you the ability to brew either 6oz, 8oz, or 10oz sizes at the touch of a button. Unfortunately the k-cup however contains the exact same amount of coffee grind no matter how much water you brew. This means that the larger cup sizes will always be watered down and weak. In fact the k-cup contains so little coffee that many people would argue that even the 6 ounce cup size is too watered down to make a full-bodied cup of coffee. Related Reading: How Big is a Coffee Scoop? The Specialty Coffee Association of America (SCAA) recommends roughly 10 grams of coffee per 6-oz of water and a k-cup usually contains about 10 grams of grind which means if you like your coffee slightly stronger than the average person then even the smallest cup size on any Keurig brewer will give you coffee that is weaker than you prefer! If you brew a 10-ounce cup then your coffee will be much weaker than recommended by the SCAA and by the standard of coffee drinkers everywhere! French Press Coffee vs Espresso: What are the Differences?